You can call Patrick and Mark Ahn's style the art of fighting without fighting. 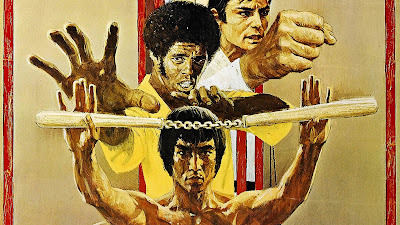 But i'm saving my Shout Factory Bruce Lee set for kung fu day. I was just about to put this on. I haven't seen it since I was a teenager. Today is a perfect day! Great podcast as always! I did want to comment on Patrick not understanding what sets Bruce Lee apart. I think part of that comes from the fact that every martial arts movie that has come after Bruce has been in some way derivative of him or in reaction to him. Even Jackie Chan's more comedic style was developed as a counter to all of the Brucesploitation that was happening in the mid-to-late 70's. If you watch late 60's or early 70's kung fu, especially out of Hong Kong, Wuxia was huge. Fights were highly choreographed dance routines. Bruce brought a power and efficiency to his fighting style that had frankly never been seen before. I think to certain extent he suffers from the same thing a lot of game-changers do: after culture has absorbed and incorporated what they've done and created they seem almost quaint. For a Bruce Lee movie with more Bruce I recommend Way of the Dragon (Return of the Dragon in the US). It's not his best movie but it is the movie that most incorporates his fighting styles and philosophy. Plus his fight with the block of wood that is Chuck Norris is an all-timer. Really enjoyed listening to this one! That's a really excellent article. A lot of the movie made me uncomfortable for such reasons, but I hadn't put it together so articulately. I found some of Fulci's comedies on YouTube. Sadly, they're neither dubbed into English or subtitled in English. I was thinking about going that route, actually. It may require a little homework, such as finding summaries of the plots or even a little consultation with an Italian dictionary, but I think you would be able to understand what is going on in a film. I have watched quite a few Italian comedies over the years without subtitles or dubbing. With dubbing, too, a little of the comedy does get lost. That's a fair point. I do still have those comedies in my queue on YouTube, so I may just yet give them a go. I suppose I could still get the gist visually, without dialogue. I think a part of Bruce Lee's lasting impact is that he, very consciously, made martial arts cool. I don't mean that in a simplistic way at all, I think he was a very savvy artist, and actively presented his art (and himself) in a way he knew would hit in America. He brought a Steve McQueen charisma and baddassocity to martial arts that is still attempted to be replicated. Even today you look at him and think, I want to be his friend. And I do not want to piss him off. Many MMA and other celebrity fighters I think are consciously or unconsciously mimicing Bruce Lee's energy. Trying too, anyway. Who specifically would you be reffering to there? Am I the only one having trouble downloading? Oh yeah, the problem was at my end. Nevermind.